Poll: Should drivers be fined for driving too close to cyclists? 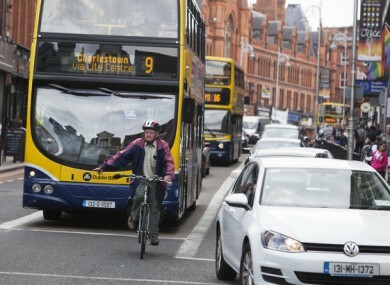 A Fine Gael proposal could mean that drivers are fined for encroaching on cyclists. The bill will aim to limit the number of cyclists killed and injured on our roads. FINE GAEL IS proposing a bill that would mean drivers could be fined and receive penalty points for driving too close to cyclists. The Irish Independent reports that the proposal could see drivers face a minimum fine of €80 and three penalty points if they’re caught moving into the cycle lane where cyclists are. According to the article, the minimum passing distance would be 1.5 metres on roads with a speed limit of 50km/h or higher, and 1 metre for roads with a speed limit below that. So we’re asking: Should people be penalised for driving too close to cyclists? Email “Poll: Should drivers be fined for driving too close to cyclists?”. Feedback on “Poll: Should drivers be fined for driving too close to cyclists?”.